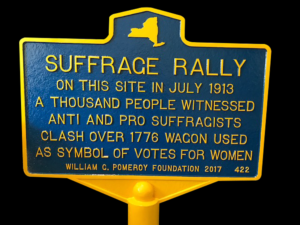 REMINDER: Visit the road marker in Huntington, New York on the main street that commemorates the “Spirit of 1776” suffrage campaign wagon. Plan ahead. 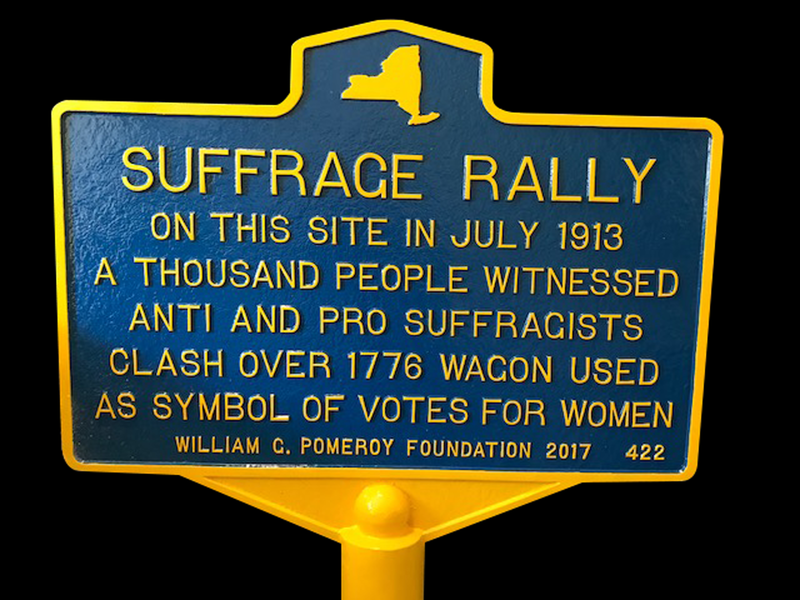 The wagon will be on exhibit at the New York State Museum in 2020, the national suffrage centennial. If it’s a good film, the moving picture can teach pass on information that lectures and books can’t touch. A case in point is the HBO production of “Iron Jawed Angels,” which stands as a classic that continues to play a significant role in the teaching of women in American history. 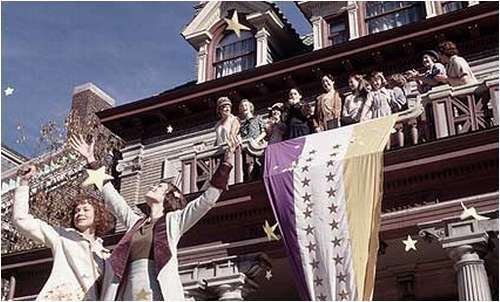 The internet has conveniently sliced the film into teachable moments, of which the opening scenes are perfect for introducing the subject of the suffrage movement in the United States. 4. Alice Paul, as a young suffragist, her point of view compared to the older suffragist activists and the differences between them in strategy and perspective and so on. Watch and see how much the film reveals that makes the suffrage movement easier to understand and expresses the importance of using storytelling techniques to make a period of history memorable and its lessons useful and significant. Iron Jawed Angels has its good and bad points, but overall it’s an adequate introduction to the topic. I agree. I think the iron jawed angels film from HBO is a good introduction to history, but it has limitations. If you are a teacher and use this film, count on filling in the missing spaces. This film is an oldie but goodie. Yes, the truth has been manipulated to make a good story, but for an introduction influenced by Hollywood, it could be worse. In fact, it’s ok as a start to lay the base for understanding the first wave.